Welcome to Waltham Youth Baseball! Welcome to Waltham Youth Baseball! Here, you can register and pay online, get news, information, schedules, rosters, game results, volunteer for shack duty, find directions and more. Check back frequently for the latest league updates. All rookie and Babe Ruth games tonight are rained out and will be rescheduled. Please keep an eye out for info from your coaches. -Bill H.
Lots of families have asked for clarification on the age chart for 2019. 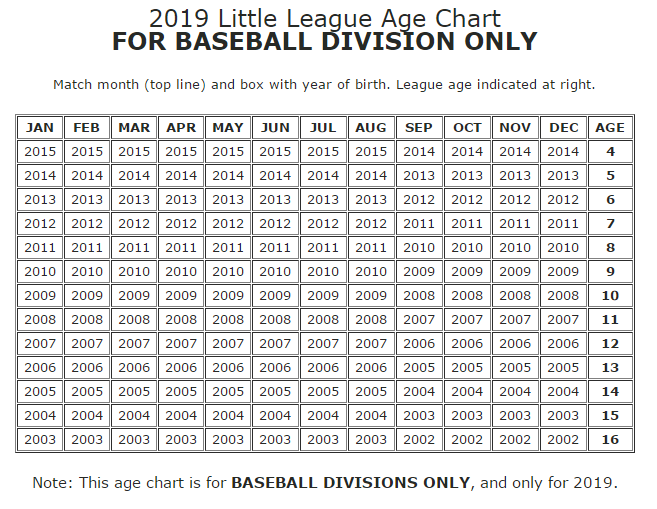 Below is the age reference from Little League. This will also apply to 2018 Fall Baseball.